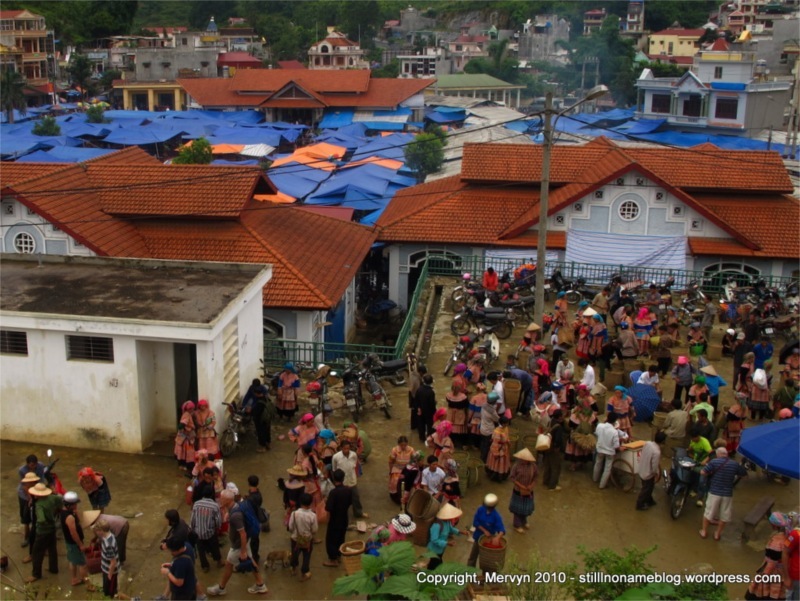 Bac Ha is a small town (pop. 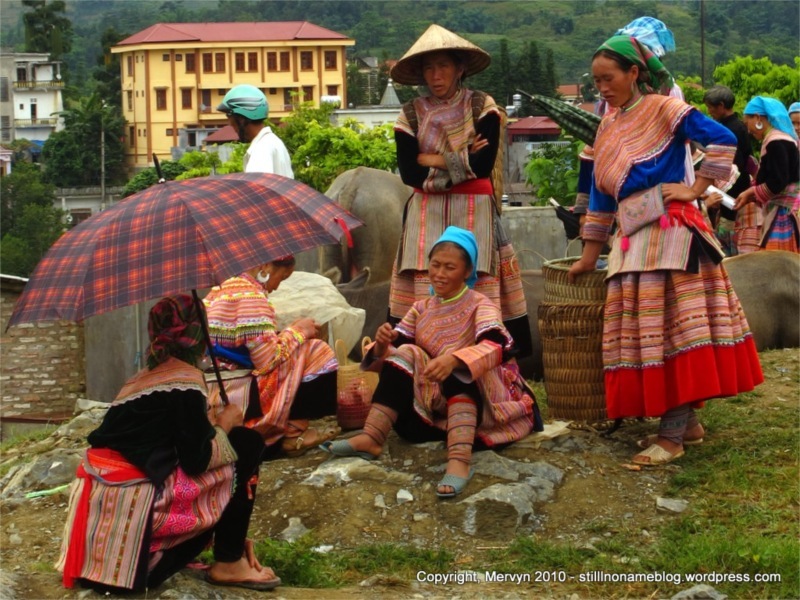 8,000) just 100 km from Sapa. It feels further, though. 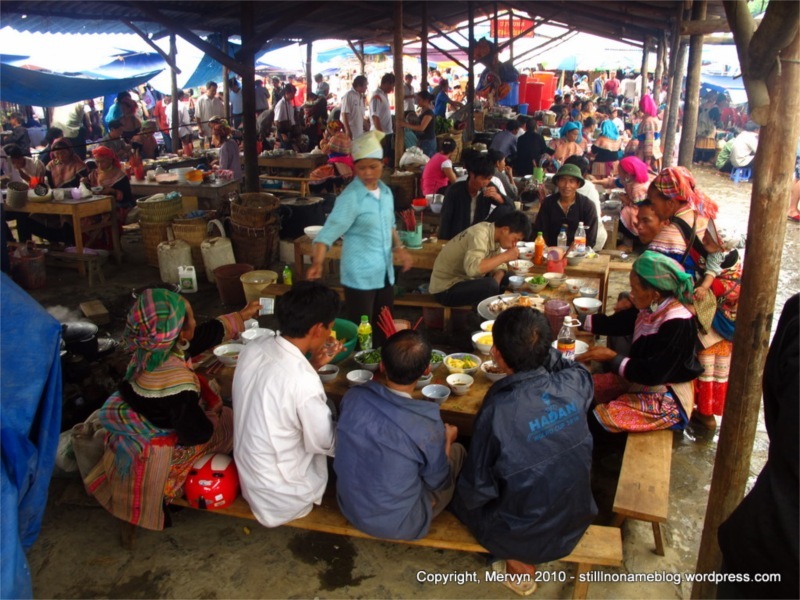 I visited for the famed Sunday market, frequented by the minority Flower Hmong people from the surrounding hills. 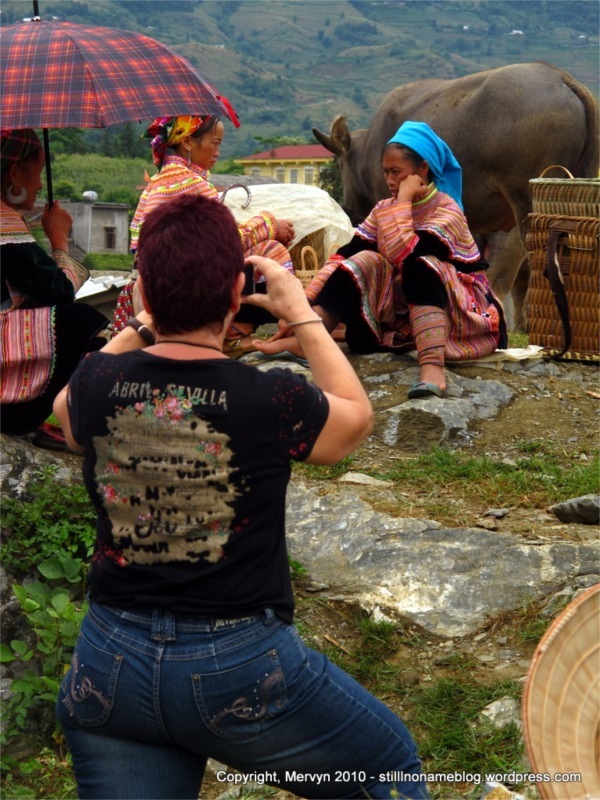 This brand of Montagnard (a French word meaning “highlanders” or “mountain people” that is used to refer to all ethnic minorities) are characterized by their brightly colored clothing. They’re a lot more Chinese than one might suspect. Really, that shouldn’t be a surprise. 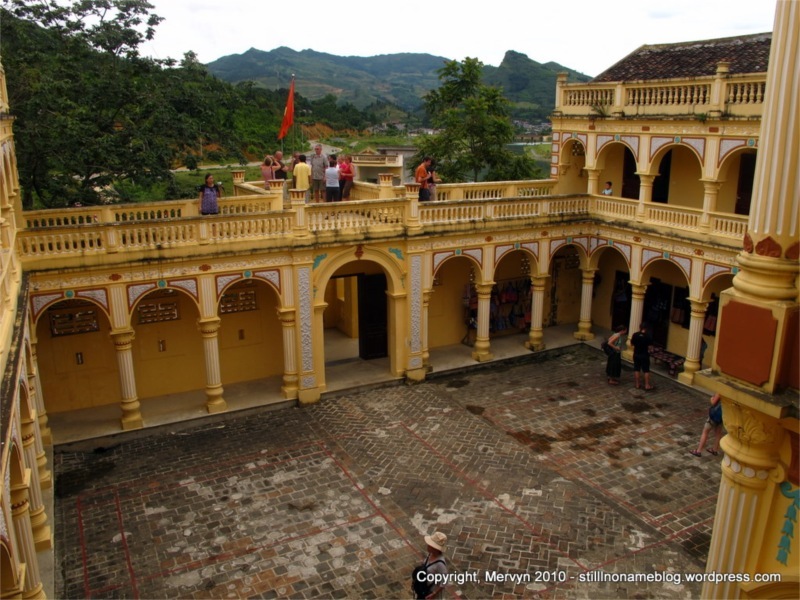 Bac Ha is very close to the Chinese border. 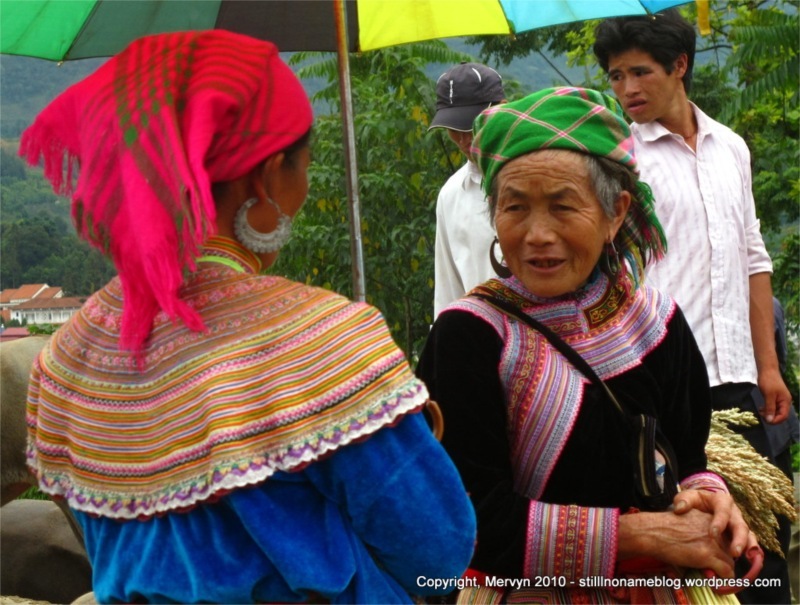 The Hmong also immigrated here from the China in the early 19th century. 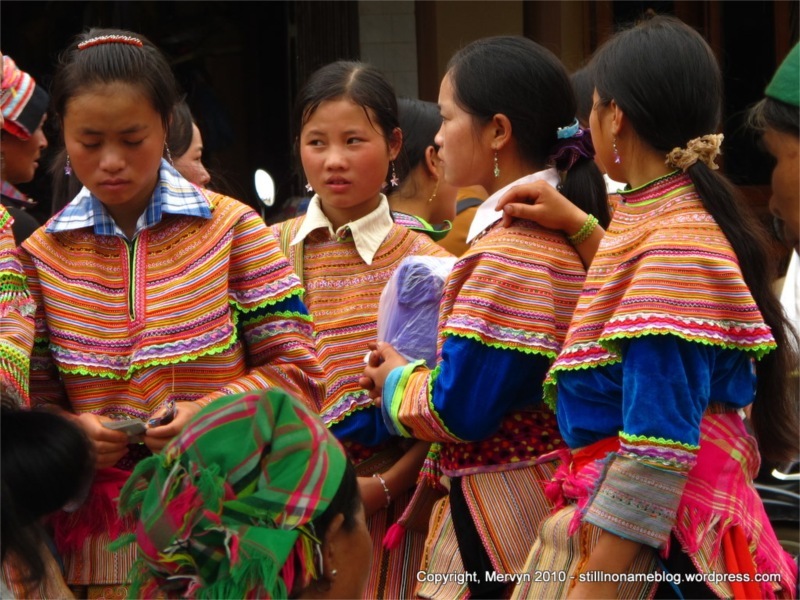 The Hmong are scattered across Laos, Thailand, Vietnam, and China so you’d expect them to exhibit bits of each of those cultures. For some reason, though, I didn’t catch anything peculiarly Chinese from the Black Hmong. 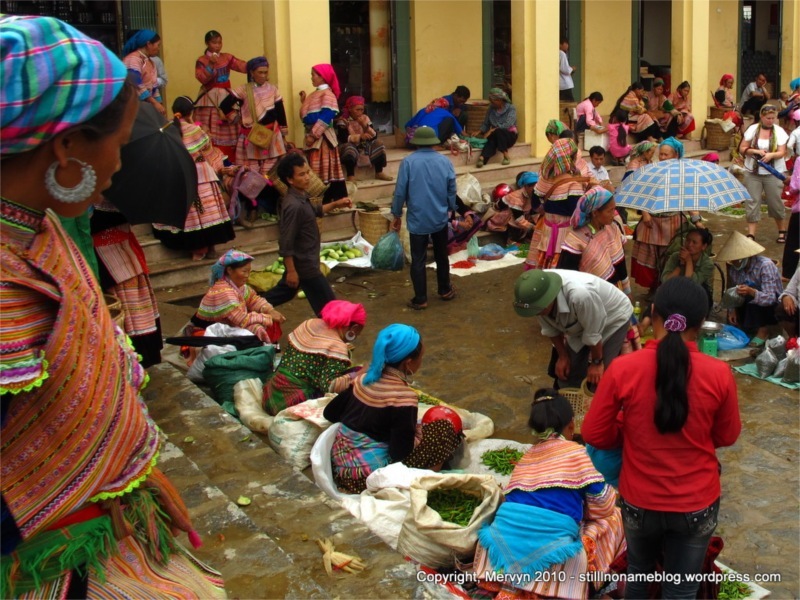 The Bac Ha Flower Hmong market, though, has an unmistakable Chinese vibe. I first noticed the similarities upon hearing the Flower Hmong language. It sounds a lot more like Chinese than it does Vietnamese. If I’d closed my eyes and been unable to see the distinctive dress, my untrained ear would have figured I was in China, not north Vietnam. It wasn’t just the language. While wandering the stalls, I felt a shove. I turned around and found a little old Flower Hmong lady with the back of her hand planted firmly in the small of my back. The courtesy push happened again and again as I walked the crowded area around the meat vendors. I was surrounded by other hints of China. Men had their shirts pulled up over their bellies. People spat more. Bargaining involved a lot more yelling. I kept having to stifle a giggle. It was like I’d cleared Chinese immigration and crossed the border. It wasn’t all China déjà vu, though. I did learn a few interesting tidbits. 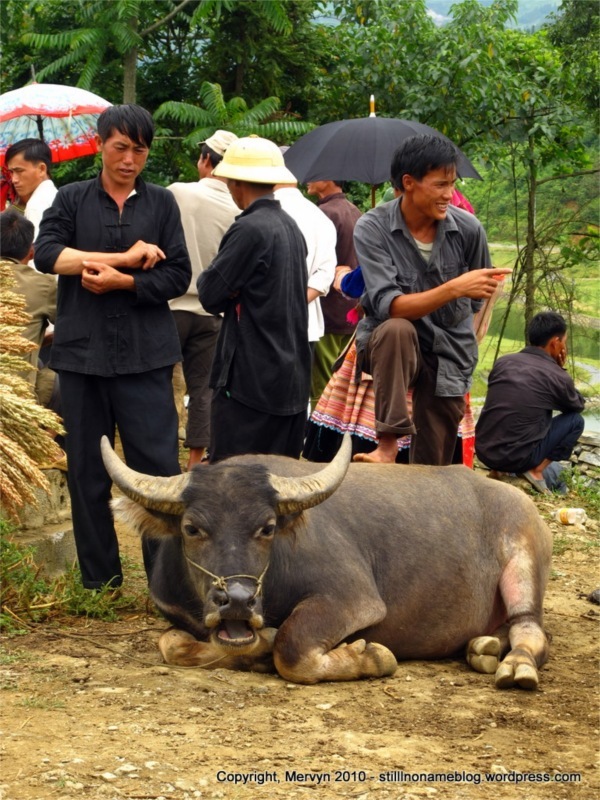 For instance, a water buffalo costs around $500 USD. It’s primarily a work animal. Eventually it might become meat, but for most of its life it will help till the fields. (This is what you learn when you eavesdrop on a tour guide). Also, the Flower Hmong women are really into the psychedelic colors. The men, not so much. It’s like the opposite of the animal world where the male of the species has to get prettied up to attract the females. 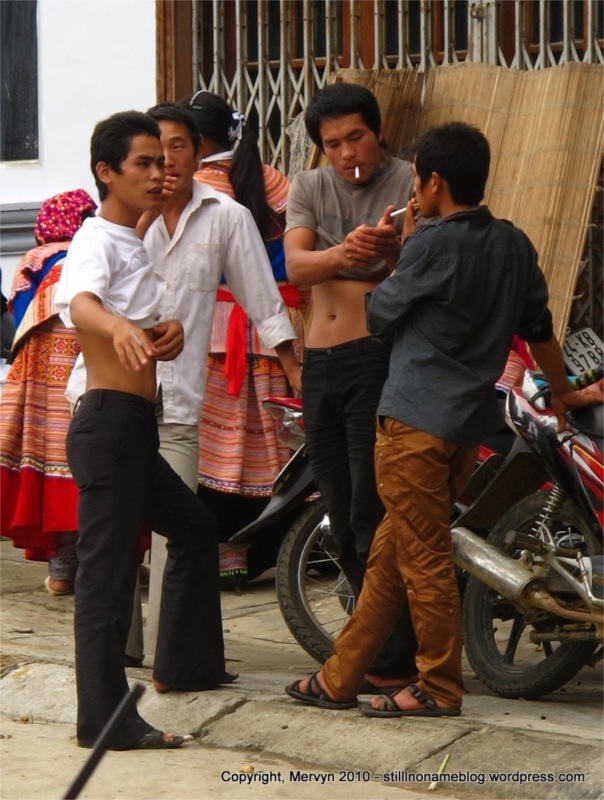 The Flower Hmong men that I saw tended to be in drab, dark colored clothing. No neon beads hanging off frocks or dizzying patters on their leggings. That’s a girl thing. The culture also seems to be quite segregated. The men tended to eat in one part of the tarp covered food area while the women stuck to another section. I’m not sure if this is just a market day thing. These people also put up with a lot of gawking as they go about their daily lives. New Yorkers always complain about tourists clogging the streets of their fair city. I can only imagine what they’d do if their tourists did what the tourists here do, which is take pictures almost exclusively of the people. Imagine going to the grocery store and having someone follow you around snapping pictures of you in the freezer aisle and you’ll have an inkling of what it must be like to be a Flower Hmong going to market. I almost felt bad taking pictures of the people at work. I tried to at least be discreet about my picture taking. Come to think of it, that only might have made it worse. 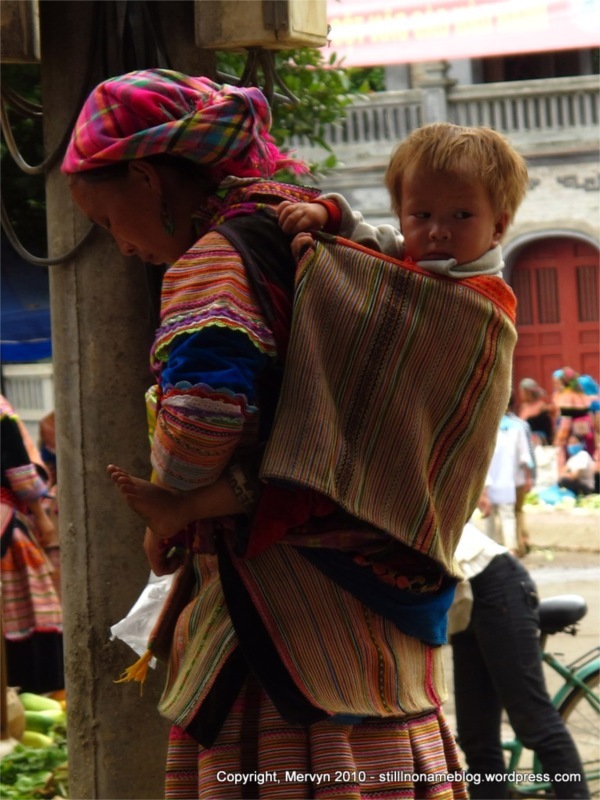 One oddity: a woman carrying around a blonde Flower Hmong child. Seriously. I don’t think his parents spent a month’s wages getting his hair dyed. I think he was just born that way. What are the chances? 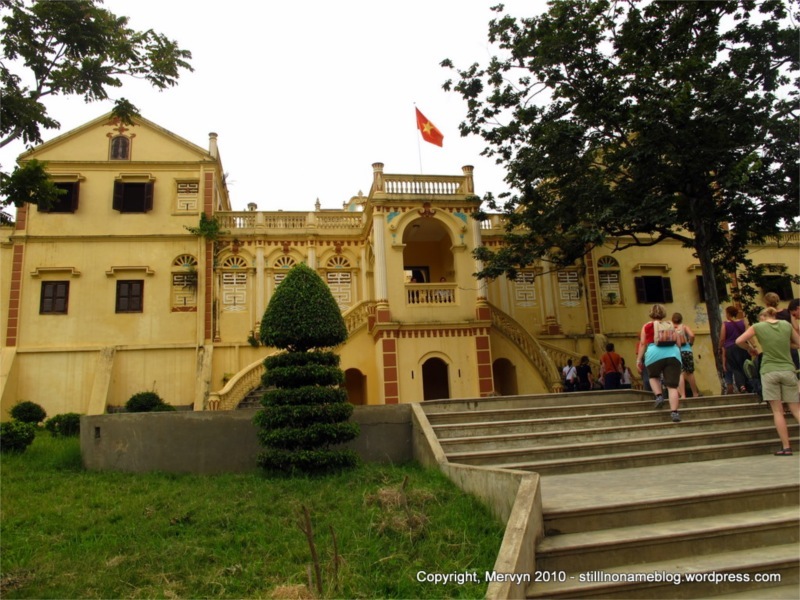 The Flower Hmong leaders kept up their people’s penchant for garish colors as evidenced by our visit to Bac Ha’s Vua Meo (“cat king house”). 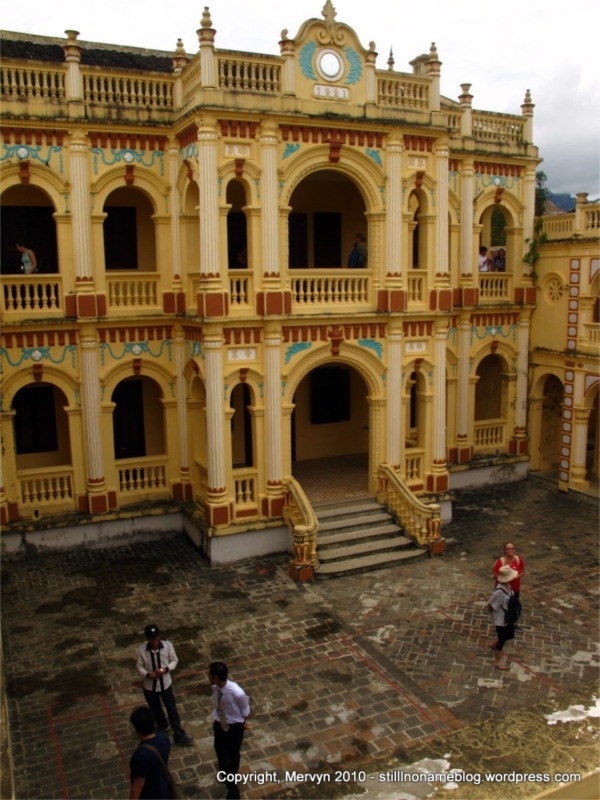 It was built in the early 1900s by the French to appease a Flower Hmong chief. The chief opted for a design from the Chinese-French-Vietnamese style, which basically means bright colors, a courtyard, and ornate façade features. It isn’t much of a sight. Can’t say I would have visited this on my own. It is interesting, though, to see how much money the French spent on the chief. Apparently they hauled special stone up the mountain from France (or was it China?). It’s a lot of expense for a people that are still relatively poor. After the market we visited the China-Vietnam border. This was apparently for people who wouldn’t be going to or hadn’t been in China. It was strange to look across the river and see a totally different country. Even if you ignored the Chinese writing on the signs, you’d have been able to tell by the architecture alone. The buildings tended to be tall, have those enclosed balconies that the Chinese like to hang their laundry in, and units that had an air conditioner. All of it was just a short swim away. The day reinforced how arbitrary borders can be. The Hmong are a people unto themselves. They retain their own culture and language but are also a mix of the majority people that surround them. They are just as out of place in China, Laos, and Thailand as they are in Vietnam. No wonder they, along with other ethnic minorities throughout Vietnam, have an independent streak and a history of defying the central government. It must be an interesting dance to keep these people in line with the central government’s plan while giving them enough independence so that they feel like they’re keeping their unique culture. In that regard, they mirror their regionalistic cousins in China. The more I travel, the more things stay the same. 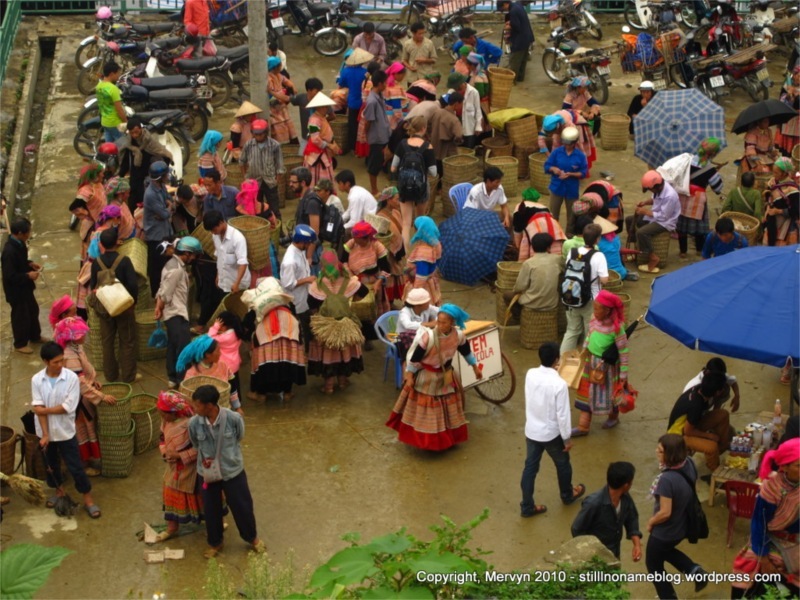 GALLERY: Click through to see lots more pictures of Flower Hmong and developing country market transactions. I would love to visit here one day. I have tons of family still living across Laos, Thailand, and China. Also, it is very common for some 100% Hmongs to be born with blonde hair. It’s not the milk man’s baby, haha. Through old folktales, it is said that Hmongs used to have blonde hair and blue eyes until all of our women were captured and raped by the Chinese. I have plenty of relatives who were born with blonde hair, like my nephew 🙂 These are some really amazing photos and I enjoyed them a lot; thanks!! Absolutely fascinating. Had no idea. Have a feeling there’s some grain of truth to that legend about the Chinese. Thanks for sharing!